Are you a US citizen? In what country were you born? Are you white or colored (if colored, state black, yellow, brown, or red)? Do you own an automobile? Horses? Mules? Rifles? Can you take shorthand. . . make garments . 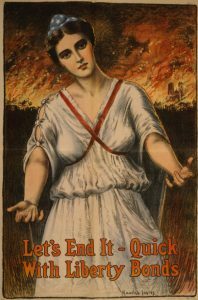 . . do farm work? Can you operate an aeroplane . . . a wireless outfit . . . a steam locomotive? 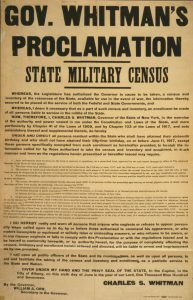 Mid-June saw hundreds of local volunteer agents, most of them women and many of them suffragists, knocking on Genesee County doors and working at registration booths to help gather information for the state’s “Military Census and Inventory.” Their job: ask every county male and female resident between ages 16 and 50 a battery of questions designed to assess New York’s resources, both human and material, that could be put to military use if needed. An identification card was issued to each person as proof that he or she had participated in the census. 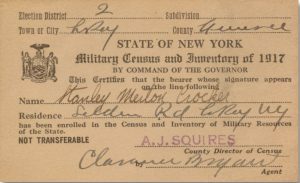 The census also automatically enrolled all male participants ages 18 to 45 in the reserve New York state militia, subject to be called into active service if the governor so deemed. To make that clear, those men received a “Notice of Enrollment Under Military Law” card. 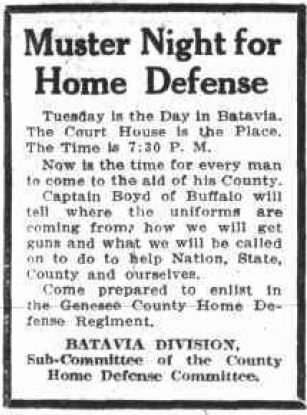 June and July also saw hundreds of males young and old—ages 16 to 64—signing up for Genesee County’s Home Defense regiment. Organized in response to a call by the state Adjutant General for every county to do so, home defense regiments were composed of volunteer community companies, each with no fewer than three officers, 18 noncoms and 36 privates, to be drilled and trained at least weekly. By September, Genesee County had formed 12 companies—three in Batavia, and one each in Alabama, Oakfield, Elba, Byron, LeRoy, Stafford, Corfu, Darien and Alexander—totaling some 800 volunteers. 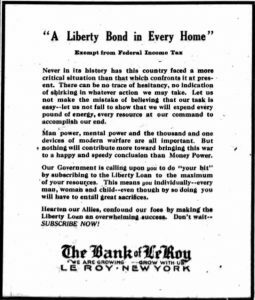 Genesee County more than did its part, too, in the Federal Government’s effort to raise two billion dollars for the war effort by selling Liberty Bonds, issued the month before. As June 15, the last day the bonds would be available, drew near, communities in the county launched intensified subscription campaigns, and again citizens responded, lining up at banks and signing pledges distributed by canvassers. In the final two days of the Liberty Loan campaign, Batavia raised more than $200,000 in bond sales. 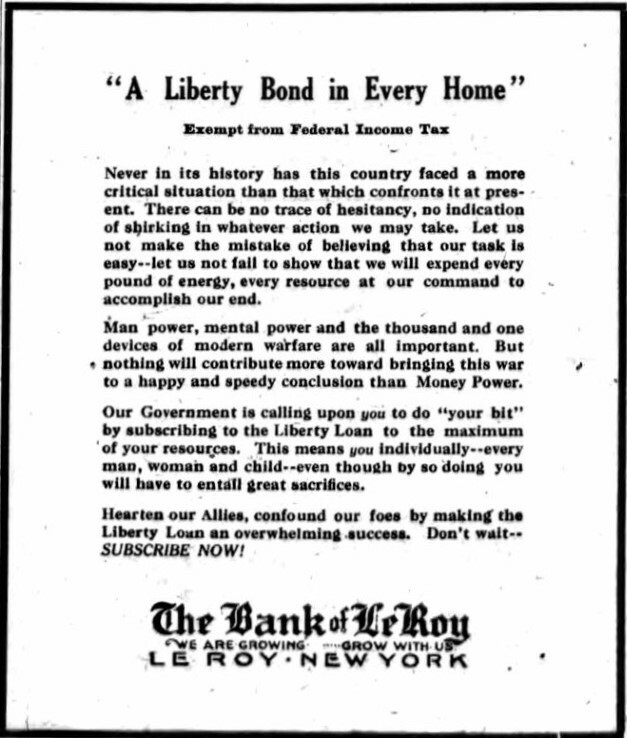 And when the bond issue closed nationwide, LeRoy led the state per capita with over $500,000 in subscriptions. Genesee County as a whole generated more than $900,000 in bond sales. It was the draft, however, that was foremost on the minds of most Americans that summer. 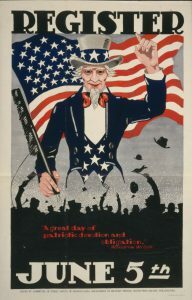 The Selective Service Act, passed by Congress just weeks before, on May 18, required all males between the ages of 21 and 30 to register for the draft on June 5. 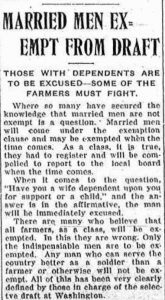 By the end of that day in Genesee County, just under 3,000 men had registered. 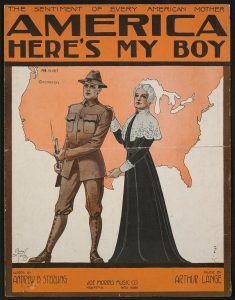 Nationally, over 10 million men had registered for war service. 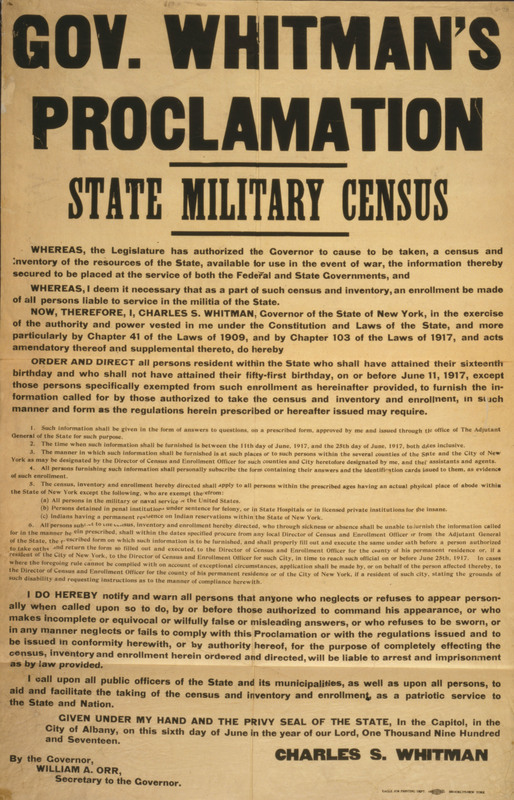 With the immediate goal of raising an initial army of 687,000 men within weeks, the Selective Service Act assigned first-draft quotas to each state, county, and large-city district based on its population. New York State’s quota was 69,241. Genesee County’s quota, originally set at 214, then 225, was eventually established: 268 young men would be called. 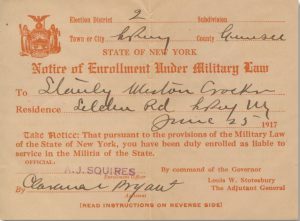 Upon registration, every draft-age man in the nation had been assigned a number from one to the total number of registrations in his county or district. 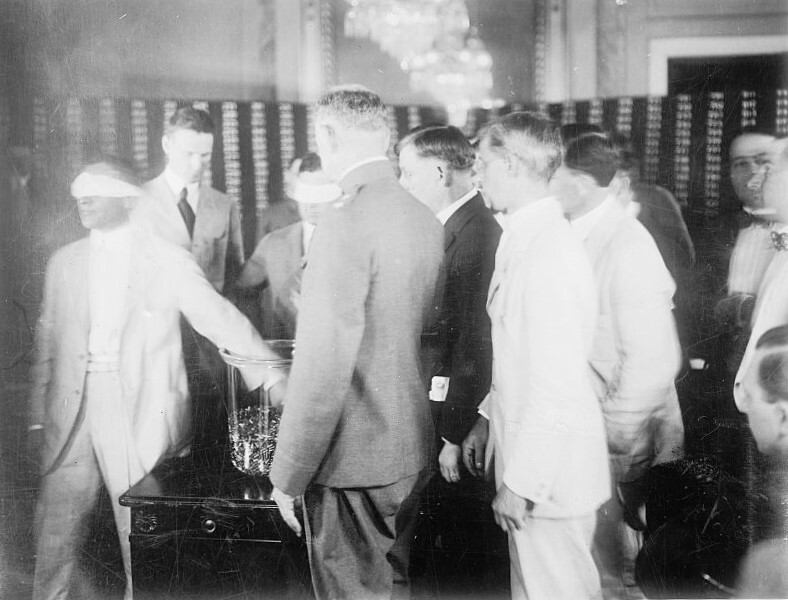 On July 20, in Washington, DC, numbers were drawn one at a time to determine the order in which men would be called for examination before their local draft boards. The first five numbers drawn were 258, 2522, 458, 1436, and 2624. In Genesee County, those numbers belonged, respectively, to Thomas J Johncox (Batavia), Howard J Radley (Oakfield), Walter N Dorschied (Batavia), Franklin H Judd (Linden), and Harry A Dobson (Pavilion). 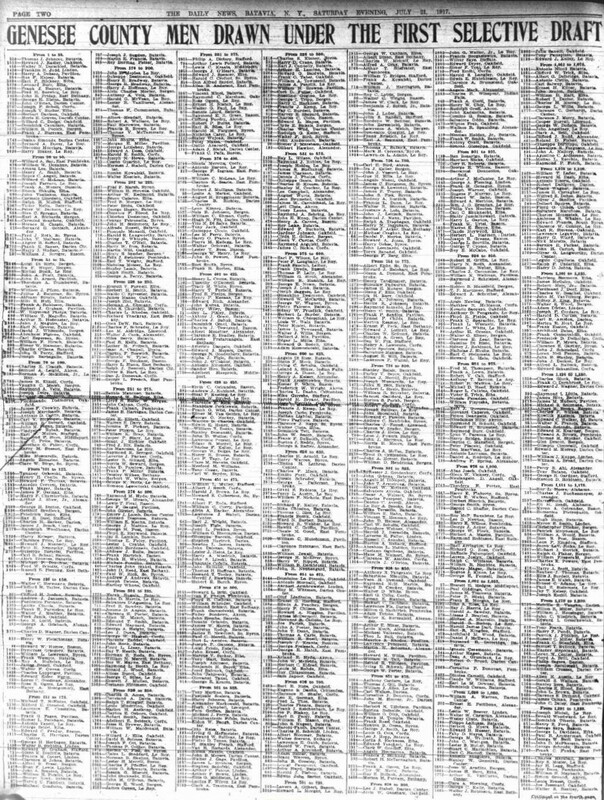 The next day, the Batavia Daily News published a full three-page list of every registered Genesee County man and his place in the order to be called for the draft. Click for: Second page of draft list. Third page of draft list. For many, the long list of local names made clear what until then had seemed an abstraction: hundreds of the county’s sons and grandsons, nephews and neighbors, friends and boyfriends, could be sent to fight in a vicious war overseas. And for those whose names appeared nearest the top of the list, particularly the first 500 or so, the call would come soon. “Hundreds of Genesee County boys and young men know today that American citizenship has its responsibilities. The draft figures made public yesterday and today excited the greatest interest. 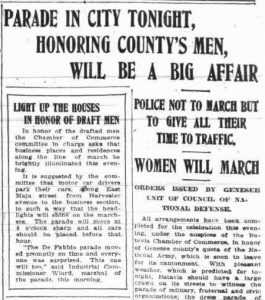 Over the following weeks, some 600 county men would be called to appear before the county draft board, made up of County Sheriff Freeman Edgerton, County Clerk Charles B. Pixley, and County Health Officer Dr. Victor M. Rice, who conducted physical examinations. A few were released for failure to pass the physical. 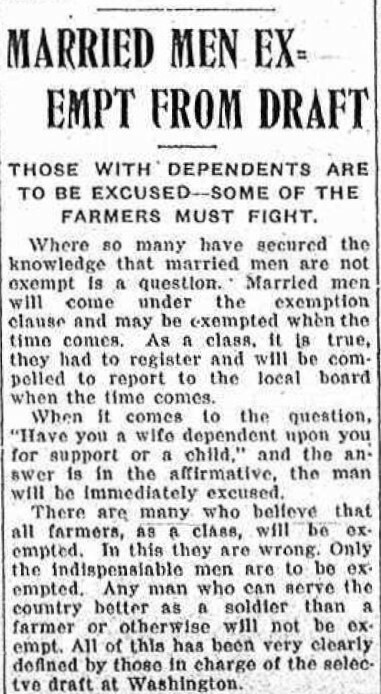 Many, about half, claimed exemptions from the draft allowed by the Selective Service Act for men working in critical industries; clergy; those holding key military, governmental, and judicial positions; and sole supporters of dependents—which at the time included most married men, and accounted for nearly all county exemption claims. The call and examination of so many men, and the review of numerous exemption cases, occupied the board for the rest of the summer. But by the end of August, as dictated by the federal draft authorities for every board across the nation, Genesee County had selected the first 45 percent of its first quota of draftees–121 men–to be sent to training camp in two groups in September. 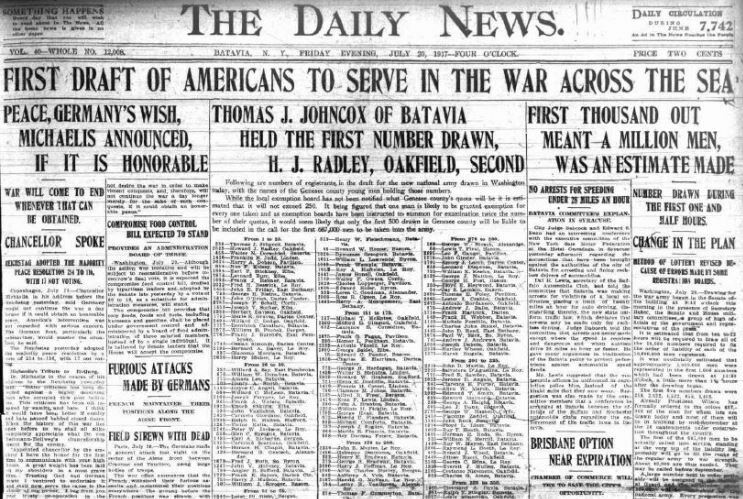 On September 5, an advance contingent of 14 county men—the first five percent of the quota, intended to help train those to follow—left Batavia for Camp Dix, New Jersey. Three weeks later, the remaining 40 percent—107 more men—boarded a New York Central to join them. 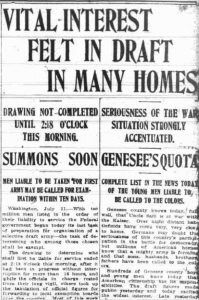 They were the first two of what would become, over the course of the war and additional draft calls, 16 contingents of Genesee County draftees. The draftees would undergo weeks or months of training before being sent overseas. 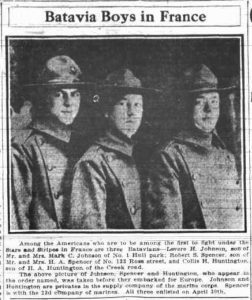 But news arrived in July that some Genesee County soldiers were already in France. 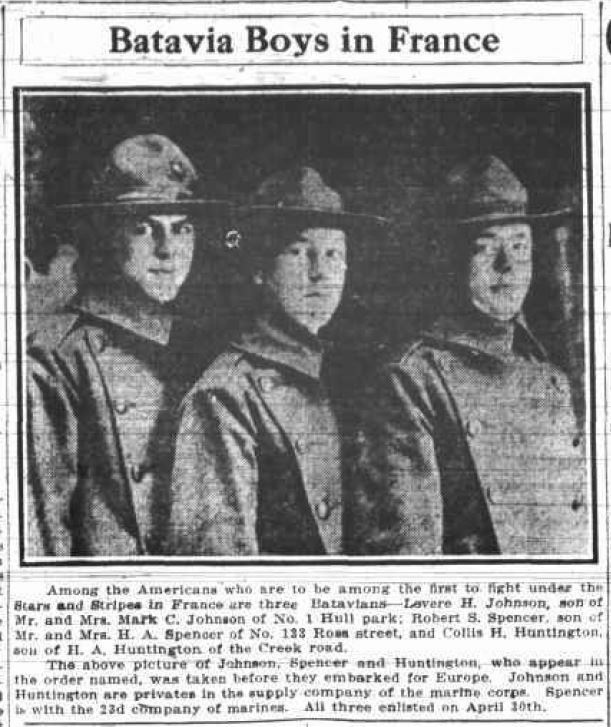 Levere H. Johnson, Collis H. Huntington, and Robert S. Spencer, members of the 5th Marines, had shipped out on June 14 as part of the first convoy of American Expeditionary Forces to leave the U.S. for the war, and landed on June 27. Sadly, Robert S. Spencer would be one of four Genesee County marines killed in the fighting at Belleau Wood a year later, in June 1918, and would become one of 66 men and one woman on the Genesee County WWI Honor Roll. So, too, would Dr. Victor M. Rice, the county draft board’s examining physician, who died of influenza and pneumonia at Camp Greenleaf, Georgia in October 1918, less than a month after volunteering in answer to a national call for army physicians to help stem a deadly flu pandemic. Retrieved from the Library of Congress: “Gov. 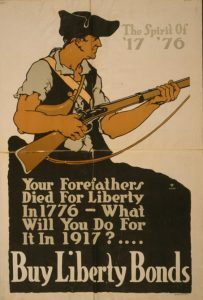 Whitman’s Proclamation – State Military Census” Eagle Job Printing Dept., Brooklyn, New York (https://www.loc.gov/item/2001700125/); “Let’s End It–Quick, with Liberty Bonds, Maurice Ingres, artist (https://www.loc.gov/item/2002695578/); “Your forefathers Died for Liberty in 1776 – Buy Liberty Bonds” The Ohio Litho Co. (https://www.loc.gov/item/2002695579/); “Register June 5th” Arthur William Colen, The Colonial Press (http://www.loc.gov/pictures/item/2001699911/); “Draft Drawing, July 1917” National Photo Company (http://www.loc.gov/pictures/item/npc2008013281/); “America Here’s My Boy” Joe Morris Music Co., New York (https://www.loc.gov/item/2013568887/). 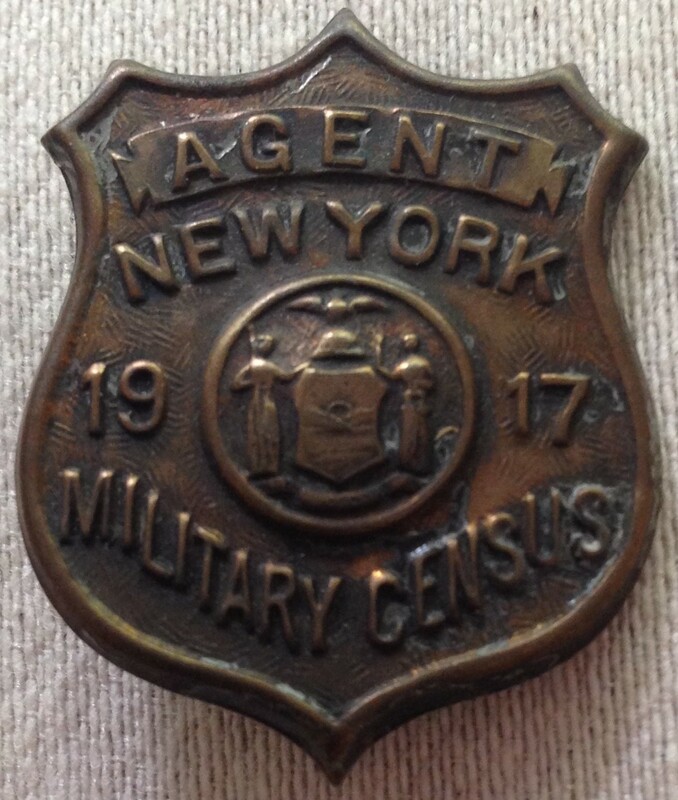 Photos ©2017 Terry Krautwurst: New York State Census badge, certification card, militia enrollment card.